Rare and obscure vinyl mixes converted for download / YouTube - if you are the copyright owner of any song and object to its inclusion please post a comment if you need to have something removed. My intention is to make sure the younger people out in cyber space know about the lost tracks which music companies have not released on compact disc. If you seek rare hits from foreign lands then please click link below to my sister blogsite: "Songs That Made It Big In Oz". The Black Diamonds hailed from Lithgow NSW. 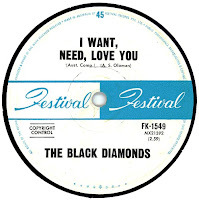 One of their big early hits was "I Want, Need, Love You". Toward the end of 1967, the Black Diamonds decided to make the big move to Sydney. The Sydney shift proved to be a fruitful one. On January 1st, 1968 the Black Diamonds became Tymepiece. 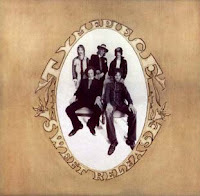 In August 1968, the band appeared on two simultaneous singles. As Tymepiece, they issued "Bird In The Tree" and producer Pat Aulton also set them up to record a version of The Tokens’ old standard "The Lion Sleeps Tonight" but under the moniker of Love Machine. 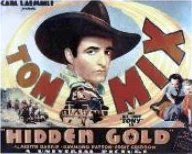 “The Lion Sleeps Tonight” was a national top 40 (#18) hit - and its “B” side, the eccentric “Lonely Hearts Club Christmas Club Party” has become something of a cult-track - a 12" extended Tom Mix of it is available at DOWNLOAD NO.131. 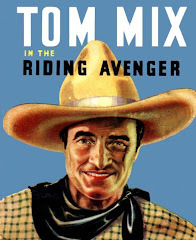 This download is for the mono Tom Mix remix of the ultra rare Black Diamond's single "I Want, Need, Love You". I am proud to have known these guys, it's a great tribute. Hey mate, this band is fantastic. I've had a hard time tracking down their stuff. If you get a chance, would you be able to upload any other tracks they had? Cooper. cares if they lose the tapes or not. I AM OLD, SHORT, BALD & FAT. WHAT ELSE IS THERE TO KNOW... EXCEPT...WELL...I AM NICE AND I USE MY POWERS FOR GOOD! THIS MUSIC BLOG WAS CREATED TO PROMOTE AUSTRALIAN MUSIC WHICH HAS BEEN IGNORED BY THE BIG MUSIC COMPANIES. ANY SONG I HAVE INCLUDED FOR SAMPLING IS A CONVERTED VINYL MIX OR A NON-COMMERCIAL REMIX I'VE BEEN ABLE TO CREATE IN MY STUDIOS. IF YOU LIKE WHAT YOU HEAR, PLEASE ASK THE MAJOR COMPANIES TO RELEASE IT ON COMPACT DISC? MOST OF THESE SONGS ARE LANGUISHING IN A BACK CATALOG AND HAVE NOT SEEN THE LIGHT OF DAY SINCE THE YEAR THEY WERE RELEASED. IF YOU ARE THE COPYRIGHT OWNER OF A WORK AND WISH TO HAVE YOUR WORK REMOVED PLEASE LEAVE A MESSAGE IN THE COMMENT SECTION. FOR THOSE WHO VISIT THIS SITE I HOPE YOU ENJOY THE SAMPLES. N.B. In accordance with Title 17 USC Section 107, any copyrighted work on this site is distributed under fair use without profit or payment to those who have expressed a prior interest in receiving the included information for non-profit research and educational or criticism purposes only, and is NOT an infringement of copyright (http://www.law.cornell.edu /uscode/17/107shtml). These songs are for evaluation purposes only, please delete them from your computer system after 24 hours. If you like the songs please support the Aussie Artists and buy their current material.